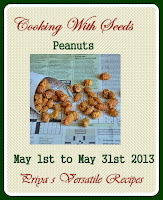 Today I am sharing with you a simple snack recipe from my childhood. My mom used to make it almost every other weekend and we just love it. Now I make it once in a while and both Hubby and Thaara enjoys this. 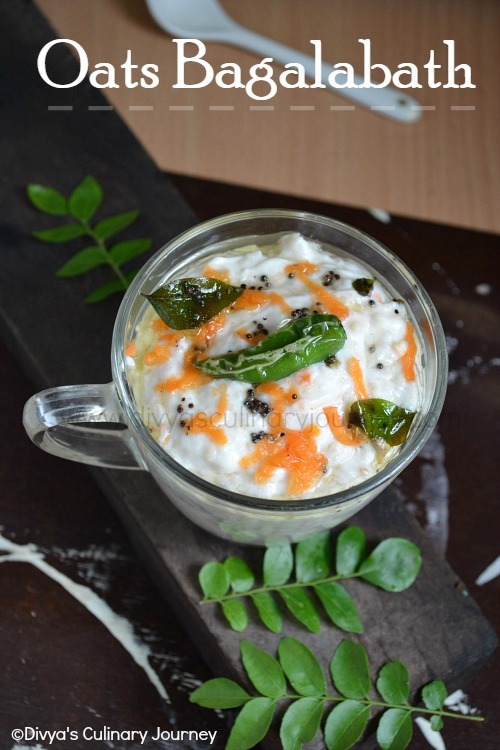 It is a simple snack that can be made in a jiffy. Heat the oil, add mustard seeds and when they crack, add the crushed garlic, red chillies, curry leaves and fry for a minute or two. 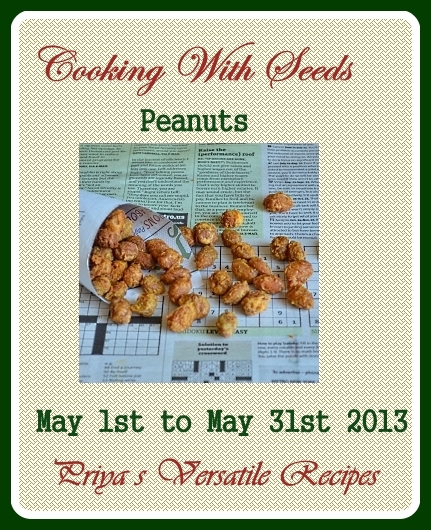 Then add pottukadalai (roasted gram) and peanuts and fry till they change color and are fried. Then add the turmeric powder, mix well. 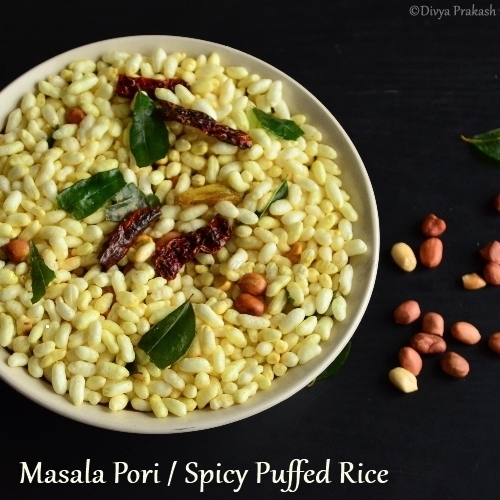 Finally add Pori(puffed rice) , mix well such that it is well coated with turmeric powder and turn off the heat. Let it cool down and then enjoy this snack. I remember my mom using coconut oil instead of the normal oil for frying. I love that flavor, but I didn't have it here so used canola oil here. In addition to red chillies, if you prefer more heat, you can add chilli powder. If you don't prefer red chillies, instead of them, you can add 1/4 -1/2 teaspoon of chilli powder, depending on the level of spice you need. 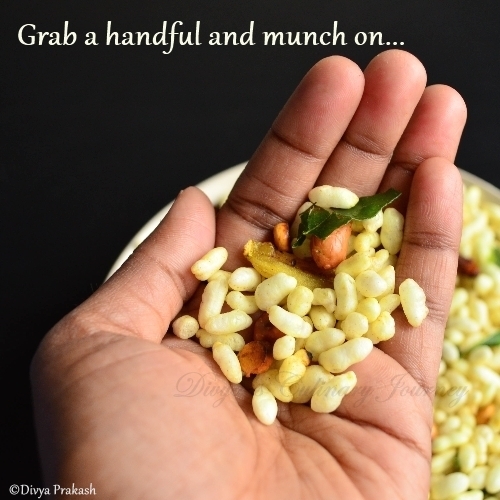 Love to munch this simple snack...yum...Lovely clicks.. I too love this. non stop muncher....super super. Looks very tempting. Yum Yum.wonderful clicks!! Delectable snack.So simple and tasty.. This is our family fav snack :) lovely Clicks Divya!! 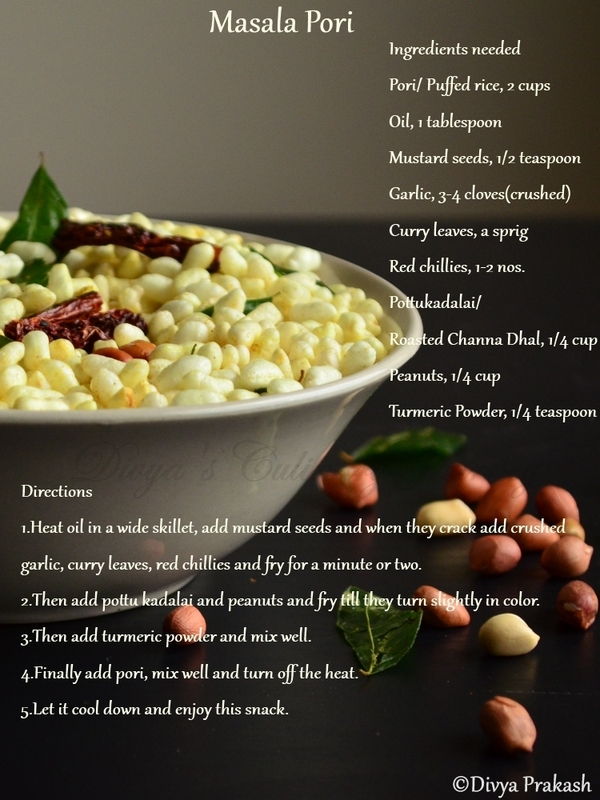 yummy n easy 2 make..
simple and yummy snack :) and very nice clicks dear !! As someone whose name is 'Kara', I'm curious to know what it translates to in this context. Help?